The key to controlling mold growth in commercial buildings, office buildings, manufacturing areas and schools is to prevent moisture problems before they start. Here are some tips to reduce water and moisture and keep your place free from contamination. – Fix any plumbing leaks as soon as possible. Standing water is a prime cause of mold growth. Clean and dry wet or damp spots within 48 hours. – Watch for condensation and wet spots around your building foundation, roofs or ceilings. Fix any sources of moisture as soon as possible to prevent water and structural damage. – Keep any heating, ventilation, and air conditioning (HVAC) drip pans clean and flowing properly. Be sure that regular building/HVAC inspections and maintenance are scheduled and performed. – Condensation forms on cold surfaces when water vapor in the air cools and becomes liquid. You’ll often see condensation on metal pipes, concrete walls, water tanks and windows. You can prevent moisture due to condensation by increasing surface temperature or by reducing the moisture level in the air. Insulation and/or increase air circulation can help do this. – Dehumidifers can help indoor humidity. It should be below 60% relative humidity or 30-50%, if possible. – Keep your foundations dry! There should be proper drainage and the ground should away from the building foundation. If rainwater continues to enter your basement from the outside, mold growth can occur. Make sure your gutters and drainage pipes are free of debris, and pointed away from the house. 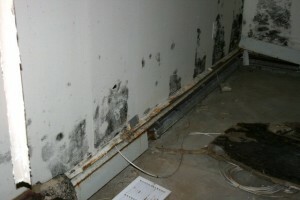 The first step in commercial mold removal is to test and identify the source of any water or moisture in the building. Once the water source is identified and repaired, then the mold can be removed safely and effectively. In many cases, the inspections and mold removal work can be performed during a business or school’s off-hours in order to limit any disruptions. If you are a commercial building owner, school or homeowner and you suspect a problem, we can help! Call us at 888-250-6653 for a free consultation. We serve New York State, New Jersey, Connecticut, Pennsylvania and Massachusetts. We also cover New York City, including the boroughs of Manhattan, Queens and the Bronx.